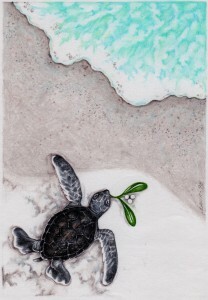 You are currently browsing the Laurie Klein Art — Laurie's Place blog archives for December, 2014. 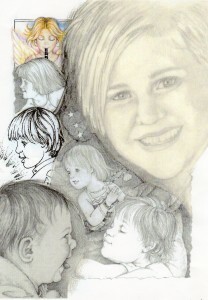 Seventeen years ago (February 1997 to be precise) a corporate pilot and a freelance artist sold their stuff (Bob called it “throwing it in the river”), packed up their little girl and their dog, stuck a pin in a map, and headed to Florida. No official jobs to speak of, most people thought it was a crazy idea, but the thinking was – i could draw anywhere, and as long as there was an airport near-by Bob could find a job flying planes. November of that same year, like a literal Phoenix, AirTran Airways emerged from the ashes of a previous incarnation with a new name, a new logo, a new slogan, and a new business model. And on May 4, 1998 former Corporate Pilot Bob began Airline Pilot training at AirTran, learning to fly the DC-9 – the jet his father had originally captained at Delta. December 1999 i created the first flying-themed Christmas card, depicting a cheery, martini drinking, cigar smoking Santa Claus Slipping the Surly Bonds in an open cockpit bi-plane. 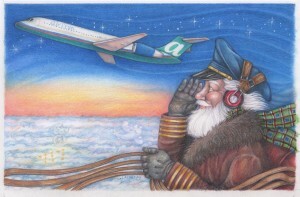 Other Santa-as-Pilot illustrations have followed since but it seemed particularly fitting to revisit that theme this year because on December 28, 2014, AirTran Airways will become the thing of legend and old pilot stories, the name and airline officially leaving the skies and becoming a chapter in the books of aviation history. The scrappy little “Airline That Could” was always something of enigma. It began life with the unfortunate “Formerly Known As…” postscript attached to it’s name, and years after that affiliation faded from memory it still wasn’t very well known among the general flying public. Despite growing into one of the country’s strongest low-cost carriers, and consistently ranking in the top 10 in airline performance and customer satisfaction, only it’s most loyal passengers ever seemed to know what it was. When Bob would say he was a pilot for AirTran, the inevitable response would be, “Air TRAIN? Is that some sort of freight company?”. But for the folks that counted, Bob’s little “Step-child Airline” (as he affectionately calls it) was known and respected as an innovative air carrier whose ticket agents, gate agents, baggage handlers, rampers, mechanics, flight attendants, dispatchers, and pilots were (and are) some of the most highly trained and consummately professional in the industry. AirTran developed a state-of-the-art reservation and boarding process, and created the cargo smoke detection and suppressant system, as well as the shielded cabin doors, used by all US airlines today. After 9/11 the AirTran pilots unanimously accepted the minimum pay guarantee (essentially taking a pay cut) so that no employees had to be laid off or furloughed. And in another example of Comrade-In-Arms spirit, AT was the first airline to grant pilots from any and all other (ie: competing) airlines the opportunity to fly non-rev, or ride the jump seat, on AirTran’s planes when they were attempting to commute to work or get home. In 2004 the last DC-9 was retired and Bob began flying its replacement – the brand new, Boeing 717. Sleek and fast, with a “glass cockpit” (no more needles and steam gauges, all computer screens), it became the sports car of the fleet. Every pilot’s dream plane. But all that success and innovation doesn’t go unnoticed forever. In 2010 another airline giant from the southwest announced acquisition of AirTran’s personnel and fleet of 737s (sadly the 717s were not needed and would be phased out). Of course major business transactions of this nature do not happen overnight, and it takes a lot of time to integrate different operating procedures, and bring everyone up to speed on the new culture, so while the transition details were finalized AirTran, and it’s “little jet”, continued to fly under it’s own name. The Ghost Squadron (as it is unofficially called) of 717s grows increasingly smaller and at the end of December, the last of the planes will be retired. But not forgotten, or abandoned. In a fitting piece of coming full circle Bob’s 717s are going to Delta, the airline where Bob’s dad began his flying career and where Jesse currently cares for the traveling public. The vertical stabilizer may be wearing a Widget rather than a lower-case “a”, but it’s still the same feisty little sports car of a jet and it has already won over its new flight crews. On December 28 the last 717 Atlanta-to-Tampa, Florida trip has been designated AirTran Flight 1 and will retrace the route taken by its predecessor airline’s first flight in October 1993. But this last flight also bears another fitting historic date and destiny because 100 years ago, on January 1, 1914, the first commercial flight took place when pilot Tony Jannus flew a passenger from St. Petersburg, Florida to Tampa. The first time a ticket was sold to the general public for point-to-point scheduled air travel. So from Critter (the Valued predecessor Jet airline’s call sign, whose logo makes a special guest appearance on the card) to Citrus (AirTran’s call sign) to a brand new radio designation, “Little a” will never be forgotten. Forever dancing the skies on laughter-silvered wings and slipping those surly bonds. 2006 was the year Jess turned 17, she would be graduating from high school and heading off to college the next year, so naturally the 2006 Christmas card had to be all about her and i thought it would be fun to show all her past holiday incarnations. So the six “Memories of Christmas Past” also featured on this card were: The Great Granddaughter – 1989, BELIEVE… In the Dreams of a Child – 1992, Chanson Pour Les Petits Enfants… – 1993, Hold Your Breath… Make a Wish… – 1994, Children of the Sea & Sky – 1995, and Behind the Dolphin Smile – 2000. While i feel fairly certain this year’s card is pretty self-explanatory i can never seem to pass up the opportunity to tell a story. So with your indulgence…. For those new to this annual tradition, i have been designing personal greeting cards since 1977, when i was given the assignment in a college printing class. Since that auspicious beginning there have been two adaptations of “A Christmas Carol“, two renderings of a partridge in a pear tree (tho once it was a pelican), anthropomorphic animals of every shape and description (nothing says Christmas like dancing Renaissance ermines), an inspired Star Wars/Good King Wenceslas design (“Master Qui-Gon Jinn looked out, on the Eve of Boonta“) and, of course, Santa Claus: Troubadour Santa, Pelican Santa, Amish Santa, Wizard Santa, Surfing Santa, WWI Flying Ace Santa, Casablanca (ie: H. Bogart) Santa, Pirates of the Caribbean Santa, and a 4-part compilation Celtic god-Scandinavian legend-medieval saint-Victorian Obi-Wan Kenobi Father Christmas Santa(s). Pleased as i am with all those cards, however, the ones closest to my heart are those six that featured Jesse. Since 1989 she has been my Muse and Inspiration. My guilty-pleasure-obsessive Star Wars/LOTR/Pirates of the Caribbean/Queer Eye/Diagnosis Murder/West Wing co-conspirator. My travel buddy. The light in the window and my very best friend. In 1991 she inspired the very first Christmas story i ever wrote and although she is about to take flight on adventures of her own design, charting her course by her own magical star, she will always be my little girl, and my own beautiful Christmas angel. As i wrote inside the card, and still believe today (and every day) ~ Treasure the moment. Celebrate the magic. Smile, it’s Christmas! So, this card was done in 2004. It was third in what became an inadvertent, unplanned, series of cards that wound up combining Christmas songs with current pop culture interests (the First: 2002 – Good King Wenceslas* with thematic variation suggested by Jesse Klein – a Good King Wenceslas /Qui-Gon Jinn & Obi-Wan Kenobi/Star Wars mash-up. The Second: 2003 – Drink Up Me, Hearties. Yo Ho – a Jimmy Buffett-Ho Ho Ho And a Bottle of Rhum (Santa’s run off to the Caribbean)/Jack Sparrow(as Santa)/Pirates of the Caribbean fusion. 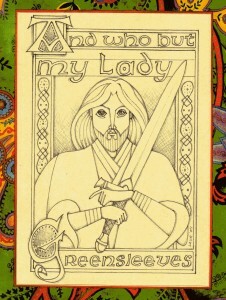 And Third: 2004 – this card – A New Northern Dittye of the Lady Green-Sleeves (Richard Jones, Ed. 1580) – Greensleeves meets Lord of the Rings/with – as i wave my hand in front of you – with a hint of Jedi influence in the tunic). What can i say – 2002, 20o3 and 2004 were obsession-heavy years for my daughter and i (my beloved Partner In Crime – which is another pop culture reference, but that comes later) and the annual Christmas card has long become a sort of illustrative representation of the Year In Review (whatever the year may happen to be). Whatever the current passion, interest, hi-light or activity winds up becoming the subject of the card and then i just twist myself into a pretzel finding a way to make it Christmas-y. Thus, Page and Monarch became Padawan and Master (Jedi) and fit Good King Wenceslas perfectly (there’s more about that in an earlier blog by the way). Santa running off to the Caribbean in Buffett’s song gave me the ideal springboard for a Pirate Santa (who just so happened to wind up looking like Jack Sparrow. What can i say – it was Young Santa, in his earlier, wild days). And in 2004 Lord of the Rings topped our Mother-Daughter list of obsessions and a favorite Medieval Christmas ballad automatically conjured up images of knights which, then, segued easily into Tolkien’s Fellowship. Of course things didn’t stop there (they never do). Then came the research – because there is truly nothing i enjoy more than looking up obscure facts to enhance an illustration, or enliven the subsequent background story. Greensleeves, has long been a favorite Christmas carol (along with good ol’ Wenceslas) and i have actually used it once before as the subject of a card (that year it was a Medieval ermine troubadour and his Lady, cos nothing says “Merrie Chrystmas” like dancing weasels) so i already had a bit of working knowledge about the song’s origins. Such as legend has it that Henry VIII wrote it for Anne Boleyn (never substantiated, and probably not true, but let’s not have the facts get in the way of a good story). I wound up finding all sorts of fascinating information about the song. There is an entry in the Stationer’s Register in 1580 licensing Richard Jones to print A new Northern Dittye of the Lady Green-Sleeves, so that was the source of the card’s title. And the earliest lyrics that survive are in A Handful of Pleasant Delights (1584). The tune, i should note, first appears in 1652. More fun (at least for me) a reading of the lyrics shows that it is not a sweet, innocuous love song, but a plea from a 16th century gentleman to his bored mistress. And there are countless versions of the lyrics (including 14 Cavalier songs and John Gay’s lyrics to the tune for The Beggar’s Opera) before William Chatterson Dix wrote the Christmas carol, What Child Is This, to the tune shortly after the Civil war. What can is say – the bawdy history behind a, seemingly innocent, Christmas carol appeals to my devilish side. Of course i had to squish all that information into the little note i included with the card (this was years before i just started writing page-long explanatory notes in eensy-weensy font size) so many people who got the card that year were a bit flummoxed by the subject and the contents. I still have people refer to it as “that weird card” (and think it kind of set the standard for the weirder cards to follow. So, per tradition, there is something of a story behind this card (there’s always a story isn’t there? I love a good back story), so allow me to share the explanation i wrote back in 2002, the year i drew, and shared, this Christmas card. 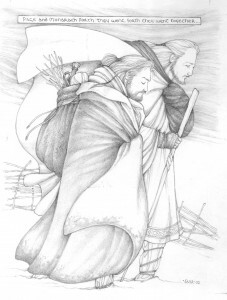 On one hand this is just a traditional rendering of one of my favorite Christmas carols (Good King Wenceslas, in case you missed the title) with the style and subject of the drawing inspired specifically by a wonderful ink illustration (of the same carol) done by A.J. Gaskin (1894). However, upon closer inspection you may notice something vaguely familiar (or Outer Rim-ish) about the Page and the Monarch… this is where the Jesse influence comes into play. Or, to be more accurate, her obsession with all things Star Wars (mine too, i should add, but this particular card was Jesse’s idea). Only Jesse could read the lyrics to a 149 year-old carol and make a Padawan/(Jedi) Master connection! Of course this is the same girl who, upon seeing the Long Hall of Trinity College in Ireland remarked that it looked just like the Jedi Archive Library on Coruscant. What can i tell you… i noticed that too! (Always kind of fun when interests and obsessions collide. Even better when you can share them with your daughter). Several times since moving here i have had the great gift of seeing wild dolphins leap in the breakers and surf on the waves, free and playful and full of joy. Twice i have seen newly hatched baby sea turtles make their tiny determined way to the beach. One day a bald eagle circled over town and recently a parade of jelly fish floated under the Bridge of Lions. Every morning the beach offers a new surprise. Like “beach glass”, it is not always easy to find, often you have to look very carefully and be very patient, but it’s there. There is magic and wonder all around us if we only take the time to look. To see the simple gifts. So look with child’s eyes. See the dolphins and sea turtles, enjoy the magic, hunt for beach glass, believe in Santa. “Taleweavers?” asked the sleepy little girl. “How do you know?” yawned the sleepy child. 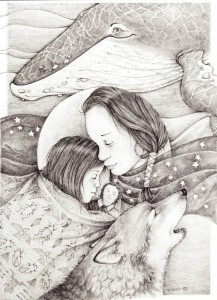 And she sang her daughter to sleep with a lullaby.